Saw some of Mike Rhode's work on a site or blog. Then picked up the books and dvds along with posting my own work to Flickr. No more typing reports on conferences I go to. And also generating ideas quicker and notes of conferences/seminars are now be passed around the office. I use pen and moleskine. The limitation of pen and paper makes it more of a commitment when I put thoughts down. With digital I feel I could go back and undo parts I didn't like. Just go for it. There is no wrong way to Sketchnote. I think sketchnoting is a great way for people to see information in a way that isn't just text on a computer screen. It engages the thinking and helps people remember what they saw in a speaker. It will be around for awhile whether pen and paper or stylus and tablet. A great addition to the The Sketchnote Handbook. 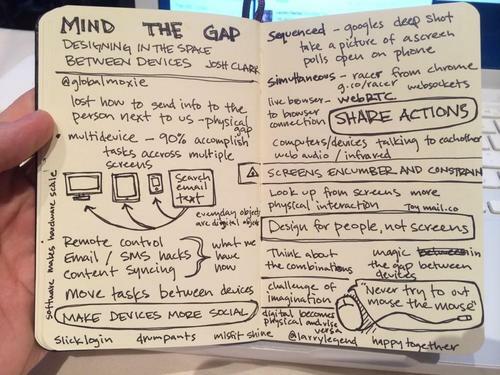 Also it was nice to have two of my sketchnotes included in the book. We thank you Jake for sharing with us.